With competition getting fiercer by the day, prominent players in the global broad ion beam technology market are experimenting with diverse strategies to emerge at the fore. Besides innovations and investing in technological advancements, several market players are keen on forging partnerships. Given the scenario, the competitive rivalry among key players are likely to get stronger in the near future, finds Transparency Market Research (TMR) in a new study. At the same time, the market for broad ion beam technology is likely to gain impetus as several of these strategies could have positive influence on its trajectory. Some of the companies operating in the global broad ion beam technology market are 4Wave Incorporated, Oxford Instruments, Meyer Burger Technology, Hitachi High-Technologies Corporation, Raith GmbH, Plasma-Therm, and Veeco Instruments Inc.
As per TMR, the global broad ion beam technology market is likely to reach US$374.0 mn by the end of 2025, compared to US$179.83 mn in 2016. During this time, TMR projects the market to exhibit a CAGR of 8.7%. Among key regional markets, North America emerged as the most lucrative one. 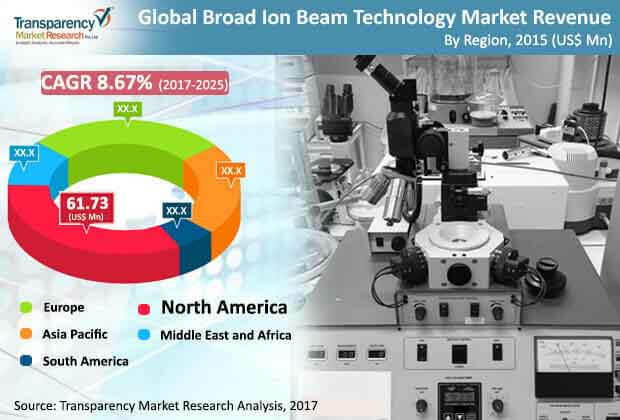 The rising prospects witnessed in the US are likely to enable the North America broad ion beam technology market gain significant impetus. In 2016, North America held nearly 36.75% of the market. From amongst the end users, the market will considerably benefit from the rising demand in MEMS and semiconductor and electronics industry. The global broad ion beam technology market is growing stronger with passing time. The robust growth witnessed in the market is supported by various factors. For instance, fabrication incurs lesser cost if it is done using broad ion beam milling. In this process low energy noble gas ion beams such as helium and argon are used. In the last couple of years, the demand for broad ion beam milling has significantly increased owing to its use for re-shining samples for transmission electron microscope. Also, the application of broad ion beam has considerably increased in nano machining, which TMR has projected to spur market opportunities in the coming years. The application of broad ion beam technology has considerably increased over the past years and these applications have highlighted various concepts such as very low energy ion beam can reduce physical spluttering in reactive etching and using multiple targets to splutter can deposit compound and alloy. The market can significantly benefit from the rising awareness of such concepts. In addition, the increasing use of broad beam ion sources in electrically powered spacecraft propulsion will ensure that the growth for the market remains steady through the forecast period. On the downside, operational complications in broad ion beam technology may decelerate its gains in the coming years. In addition, disproportionate ion-beam current is often considered objectionable as it may speed up wear and tear of accelerator grid and increase the target impurity. Until these concerns are mitigated, the market’s trajectory may remain a little restrained. Nonetheless, with several technological advancements on card, the market is likely to witness numerous growth prospects in the coming years. This, coupled with innovations in photovoltaic cells and rapid expansion of the semiconductor and electronics industry will enable the market prosper in the coming years.